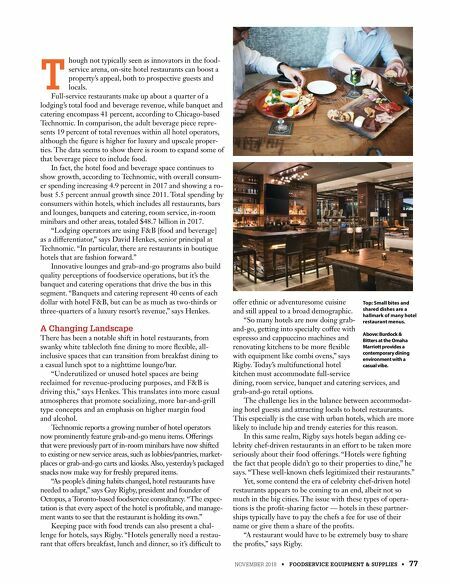 NOVEMBER 2018 • FOODSERVICE EQUIPMENT & SUPPLIES • 77 T hough not typically seen as innovators in the food- service arena, on-site hotel restaurants can boost a property's appeal, both to prospective guests and locals. Full-service restaurants make up about a quarter of a lodging's total food and beverage revenue, while banquet and catering encompass 41 percent, according to Chicago-based Technomic. In comparison, the adult beverage piece repre- sents 19 percent of total revenues within all hotel operators, although the •gure is higher for luxury and upscale proper- ties. The data seems to show there is room to expand some of that beverage piece to include food. In fact, the hotel food and beverage space continues to show growth, according to Technomic, with overall consum- er spending increasing 4.9 percent in 2017 and showing a ro- bust 5.5 percent annual growth since 2011. Total spending by consumers within hotels, which includes all restaurants, bars and lounges, banquets and catering, room service, in-room minibars and other areas, totaled $48.7 billion in 2017. "Lodging operators are using F&B [food and beverage] as a differentiator," says David Henkes, senior principal at Technomic. 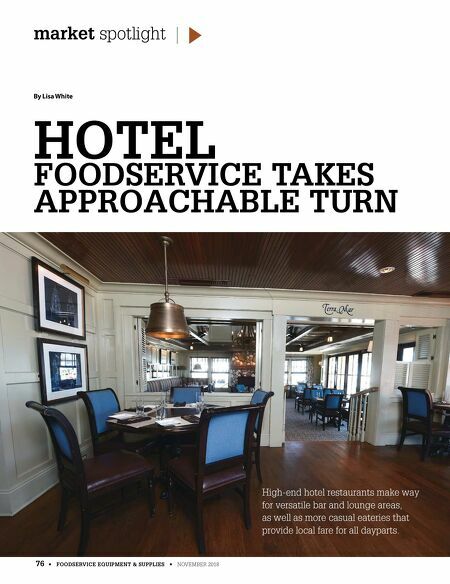 "In particular, there are restaurants in boutique hotels that are fashion forward." Innovative lounges and grab-and-go programs also build quality perceptions of foodservice operations, but it's the banquet and catering operations that drive the bus in this segment. "Banquets and catering represent 40 cents of each dollar with hotel F&B, but can be as much as two-thirds or three-quarters of a luxury resort's revenue," says Henkes. A Changing Landscape There has been a notable shift in hotel restaurants, from swanky white tablecloth •ne dining to more 'exible, all- inclusive spaces that can transition from breakfast dining to a casual lunch spot to a nighttime lounge/bar. "Underutilized or unused hotel spaces are being reclaimed for revenue-producing purposes, and F&B is driving this," says Henkes. This translates into more casual atmospheres that promote socializing, more bar-and-grill type concepts and an emphasis on higher margin food and alcohol. Technomic reports a growing number of hotel operators now prominently feature grab-and-go menu items. Offerings that were previously part of in-room minibars have now shifted to existing or new service areas, such as lobbies/pantries, market- places or grab-and-go carts and kiosks. Also, yesterday's packaged snacks now make way for freshly prepared items. "As people's dining habits changed, hotel restaurants have needed to adapt," says Guy Rigby, president and founder of Octopus, a Toronto-based foodservice consultancy. "The expec- tation is that every aspect of the hotel is pro•table, and manage- ment wants to see that the restaurant is holding its own." Keeping pace with food trends can also present a chal- lenge for hotels, says Rigby. "Hotels generally need a restau- rant that offers breakfast, lunch and dinner, so it's dif•cult to offer ethnic or adventuresome cuisine and still appeal to a broad demographic. "So many hotels are now doing grab- and-go, getting into specialty coffee with espresso and cappuccino machines and renovating kitchens to be more 'exible with equipment like combi ovens," says Rigby. Today's multifunctional hotel kitchen must accommodate full-service dining, room service, banquet and catering services, and grab-and-go retail options. The challenge lies in the balance between accommodat- ing hotel guests and attracting locals to hotel restaurants. This especially is the case with urban hotels, which are more likely to include hip and trendy eateries for this reason. In this same realm, Rigby says hotels began adding ce- lebrity chef-driven restaurants in an effort to be taken more seriously about their food offerings. "Hotels were •ghting the fact that people didn't go to their properties to dine," he says. "These well-known chefs legitimized their restaurants." Yet, some contend the era of celebrity chef-driven hotel restaurants appears to be coming to an end, albeit not so much in the big cities. The issue with these types of opera- tions is the pro•t-sharing factor — hotels in these partner- ships typically have to pay the chefs a fee for use of their name or give them a share of the pro•ts. "A restaurant would have to be extremely busy to share the pro•ts," says Rigby. Top: Small bites and shared dishes are a hallmark of many hotel restaurant menus. Above: Burdock & Bitters at the Omaha Marriott provides a contemporary dining environment with a casual vibe.